Stephen D. Strowes - The year that was 2014. 2013 ended on a really nice uptick for me. 2014 contined that trend. On reflection, 2012 and 2013 featured instability, and probably more than I was willing to admit at the time. After defending, graduating, taking a job, and moving country in 2012, then riding through a job hunt, a visa transfer, and starting a new job in 2013, 2014 featured none of those things. Ending the year employed by a large company lent stability entering 2014. I’ve been encouraging IPv6 adoption at Yahoo for over a year; I’ve been in my apartment for over two. I feel like, for the first time in a while, I’m stable. It’s interesting to consider, in hindsight. The new role has let me attend a few conferences I enjoy: I attented IETF89 to keep up with the industry, then SIGCOMM and the Internet Measurement Conference to keep up with the research. But my personal highlight was perhaps delivering a guest lecture at Berkeley on IPv6. It was a year short on publications, however, despite still paying attention to some of the same trends as I have been for years now. Professionally, a good year. Travel wasn’t sparse, but a little uninteresting, featuring only anglosphere cities. 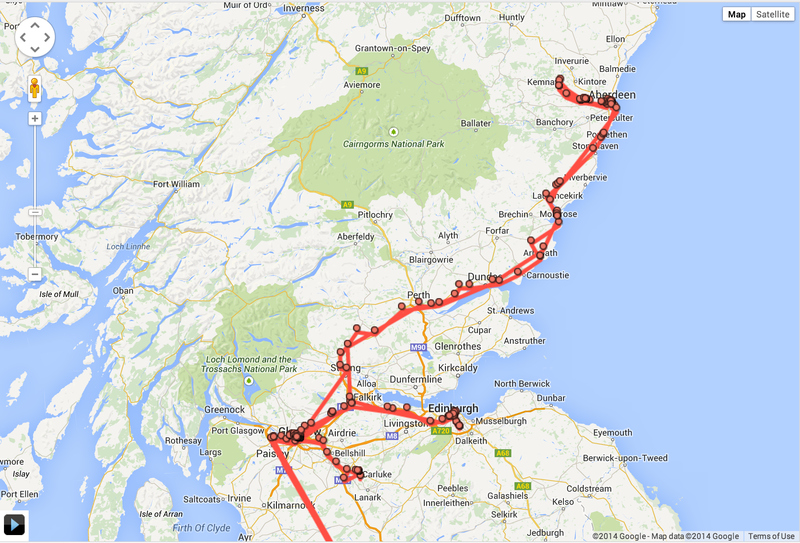 London, Dublin, Chicago (for SIGCOMM), Vancouver (for IMC), and basically a tour of Scotland. Not that any of these places are bad; in fact, the North American cities were new to me, and I’m always happy to go home. They’re just places steeped in the familiarity of English-speaking world, and I enjoy time away from all of that. Running: 870km throughout the year. This featured the Bay to Breakers 12k, and one of the San Francisco half marathons, both completed in times I’m happy with. I’m planning on doing Bay to Breakers again, and completing the other half marathon, in 2015. Peering into the future, I reckon I find myself in a good place. I’ve started planning short trips around upcoming three day weekends. I’m planning on a similar conference rota to 2014, and similar goals for my running. Stability has allowed me to get back into being pretty healthy. I’m going to put a little more focus on health and fitness, and with luck I’ll find time to take a vacation someplace interesting. In all ways, I’m looking forward to 2015; it’s not likely to be dramatic, but it is likely to be good. Posted by Stephen Strowes on Saturday, January 10th, 2015. You can follow me on twitter. 26 Feb 2017 » The year that was 2016. 30 Jan 2016 » The year that was 2015. 08 May 2015 » Who wins? 10 Jan 2015 » The year that was 2014. All content, including images, © Stephen D. Strowes, 2000–2016. Hosted by Digital Ocean.